We’d love your help. 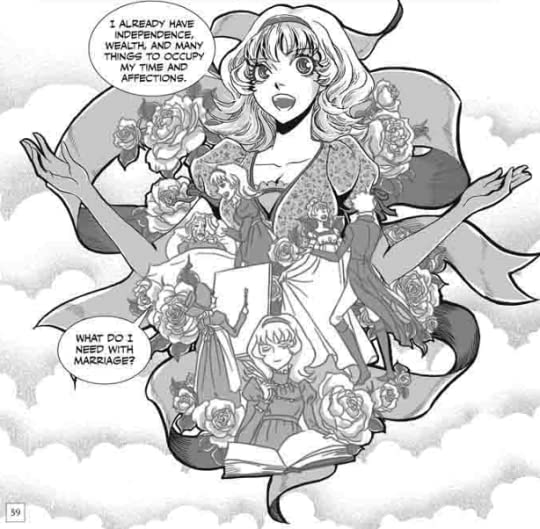 Let us know what’s wrong with this preview of Manga Classics by Stacy King. To ask other readers questions about Manga Classics, please sign up. may i ask how i can even read thebook?? Camille NetGalley currently offers the book for review. Emma is the second Manga Classic I read. 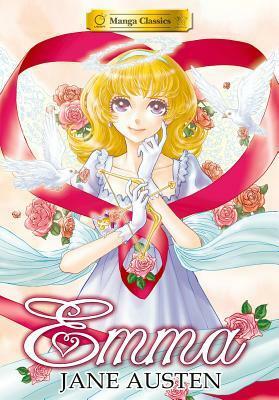 This Manga is based on Jane Austen's classic novel Emma. I did not enjoy reading Emma as much as I anticipated. The story was ok. Emma is a delusional girl and a match-maker. She assumes two people are in love and tries to set them up for marriage. Even though she was the protagonist but I didn't like her much in the start. At the end, she gets better when she realizes her mistakes. Mr. Knightly was my favorite. Tall and handsome. Not to forget, he is sensi Emma is the second Manga Classic I read. 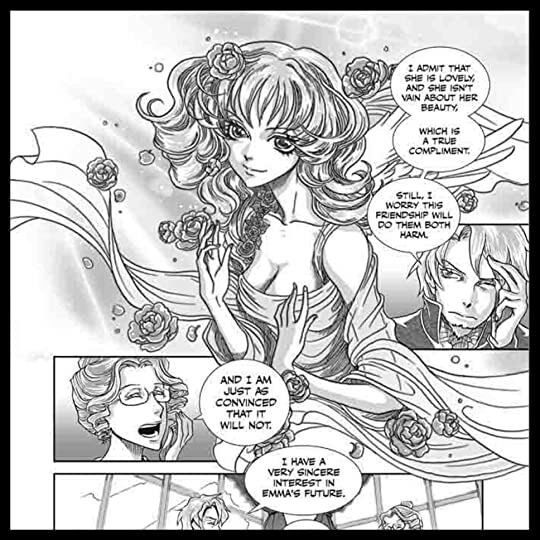 This Manga is based on Jane Austen's classic novel Emma. Mr. Knightly was my favorite. Tall and handsome. Not to forget, he is sensible and a gentleman - always talking some sense into Emma. I have given two stars to the story but I would love to add two more stars just for how beautifully this Manga Classic was created. The detailing is absolutely beautiful. I loved looking at them closely and took my time to read each page. Emma is only my second Manga Classic rewriting (the first one was Pride and Prejudice) and I must say that I liked Pride and Prejudice better. I think, however, that this slight preference of mine is due to the fact that the story and the tone of the original Pride and Prejudice are better suited for a comic adaptation. Adapting Emma in this form was no easy task at all, and truth be told, once again I am really impressed with Po Tse's and Crystal S. Chan's work. I'm grateful that the publisher has given me an opportunity to download and read these amazing adaptations to manga of some of the classics. I admit that I still haven't read my copy of the novel of this particular classic book; so this manga version is a big help because I was able to read on how amazing this story is. Reading the novel version would take me at least a week or more to be able to finish because they are really long. But this manga adaptation/graphic novel really made it easier f I'm grateful that the publisher has given me an opportunity to download and read these amazing adaptations to manga of some of the classics. I admit that I still haven't read my copy of the novel of this particular classic book; so this manga version is a big help because I was able to read on how amazing this story is. I knew absolutely nothing about the original Emma by Jane Austen so I had no idea what to expect going into this. I’m sure the original Emma is probably a bit more serious, but I thought this was a super sweet, light story with little bits of humor that work so well with this art style. Just like I mentioned in my review of Les Miserables, this one has inspired me to read the original novel and even check out the movie. I also think it is a great way to tell a classic story in a modern way, which I knew absolutely nothing about the original Emma by Jane Austen so I had no idea what to expect going into this. I’m sure the original Emma is probably a bit more serious, but I thought this was a super sweet, light story with little bits of humor that work so well with this art style. Just like I mentioned in my review of Les Miserables, this one has inspired me to read the original novel and even check out the movie. I also think it is a great way to tell a classic story in a modern way, which is sure to captivate new audiences. Things happen a little quickly in this adaption but the positive side is that there really isn’t any filler, making for a fast read. However, it is a bit difficult to keep all the characters and names straight since we don’t get to know too much about anyone. I just had the opportunity to read the delightful Pride & Prejudice rendition for the Manga Classics series so I eagerly snatched this one up to read Jane Austen's Emma turned into a graphic novel. While I enjoyed many of the same aspects of this one that I did in P&P, I didn't love it. More on that in a minute. The story follows the same path as the original with the same characters as it should. Emma is a young lady from a good family who happens to be one of the two leading families in I just had the opportunity to read the delightful Pride & Prejudice rendition for the Manga Classics series so I eagerly snatched this one up to read Jane Austen's Emma turned into a graphic novel. While I enjoyed many of the same aspects of this one that I did in P&P, I didn't love it. More on that in a minute. Emma decides that since her first go at matchmaking went so well that she'll give it another go much to her friend and neighbor, Mr. Knightley's chagrin. He tells her not to meddle and he is particularly concerned when she meddles with a young, naive girl boarding at the nearby Goddard school. Harriet is a sweet girl, but she has no claims to family or good breeding. Emma elevates her to the status of Miss Emma Woodhouse's particular friend and then sets about bringing Harriet and the reverend, Mr. Elton, together. Added to her machinations on Harriet's behalf, Emma is further unsettled by the arrival in the village of an accomplished young woman that Emma sets up as her rival, Miss Jane Fairfax. And then there is the flirty and friendly Frank Churchill. All the while, Mr. Knightley frowns on many of Emma's choices and way of looking at things. Emma learns when it is too late that she was so busy about other's business that she might have missed her own shot at happiness. Now the part that fell short for me was Emma, herself, or at least the way I felt Emma was depicted. I never really got this from reading the original, but in this one, she came across as a class-conscious snob and self-absorbed. She notices nothing of real importance and even argues with everyone who contradicts her or tries to point out to her what she is missing. I'll grant you this; she had a huge growth arc in the story and I was glad to finally see in the end that she realized all her mess-ups. But where the novel portrays her as someone trying to be good and kind and going about it wrong, this one didn't give that vibe. It could just be me and others won't get that impression. Regardless, it is worth the read and I love the added dimension that a graphic novel can bring to a story. Those who wish for a reacquaintance with the classics or a first introduction might find this a nice option. This is probably the least favorite of Jane Austin creation. Emma is just...irritating. Match-making all the time even if she is not that good. (Ok she was half good as mentioned in beginning of the book) but that other than that one couple, she caused nothing but confusion and heart-break including her own. Now you might be wondering why attach 'Sonam Kapoor' here. You see I'm not great fan of the actress but when I realized she is acting in the movie which is Emma adaption, I decided to watch the movie. May be some good movie time, right? Wrong! Till date I can't understand 'I disliked the movie because of Emma or Sonam'. Ah well, one of the galaxy's dilemma...may be I'll never have an answer! But regardless Manga was amazing and even after some time I was able to overcome Emma's childish attitude and liked her. May be in comics everything passes quickly where as in novel things feel stretched sometimes...may be! I was delighted to see there was a new Manga Classic on Netgalley, after I read several others already (Les Miserables, The Scarlet Letter and Pride & Prejudice). I'd never read the original Emma so I didn't know what the story was going to be about and I can't judge if the manga represents the story well. Overall, it was a very fast and light read that did remind me of Pride & Prejudice. It's not completely my cup of tea, but since it's such an easy read this didn't bother me. I liked it just as I liked the other Manga Classics, and like with the others, I wanted to read the original work afterwards. I know I've said it before, but these books are a great way to introduce people to classics they may otherwise have not read. Although the style and story worked together well during the biggest part of the book, there were some instances where there was an info dump in a few pages that were basically just an exposition text. Beautifully illustrated adapted version of this classic novel, I love manga and this is a wonderful start to those who haven't read classics before. I was pleasantly surprised by this book. All the major plot points are there, though some of the finer nuances and changes in attitude which a reader would infer from the text in ‘Emma’ are here spelled out more clearly as there is less text to describe things. I hadn’t read anything in the Manga style before. There is a useful user guide at the front of the book (what I would usually consider the front of a book) for people new to Manga to tell you how to read the book. I knew it went from back to front but it also tells you how to read across the page. I quickly got used to the reading direction and I enjoyed the drawing style of the illustrator. It gave the story a real sense of movement and energy that I enjoyed. I liked the appearance of some of the characters very much – Emma was particularly good, as was Harriet, who was adorably cute, just the type of girl who would catch Emma’s eye. For me, some of the gentleman were less successful – Robert Martin is almost like the Hulk, he’s so huge as to be monstrous! Mr Knightley was very stylised, and looked quite elfin, which didn’t strike me as quite right for his character. As I said, I wondered how the book would fare with the loss of Austen’s ‘voice’ in this low-word format, and for me it loses some of its charm, though the Manga style has a charm of its own. I think part of the target audience for this type of book would be people who’d read a graphic novel but not a novel. Personally I wouldn’t give this to somebody who was reading ‘Emma’ for the first time; I think they’d get all the plot but without the icing on the cake that Austen’s style provides. However, it’d be an interesting addition to an Austen-lover’s library. I enjoyed this book and I’d rate it as a 4 star read. Fun, funny, and gorgeously illustrated, this is a pitch perfect retelling of Jane Austen's classic novel. Fans of manga will love the intricate details, lively facial expressions, period clothing, and beautiful settings, while fans of Jane Austen will love the witty banter and hilarious plot as Emma tries her hand at matchmaking. I wasn't sure how well the novel would translate to manga, but this did an excellent job. I was especially impressed by how closely the manga followed the plot and how Fun, funny, and gorgeously illustrated, this is a pitch perfect retelling of Jane Austen's classic novel. Fans of manga will love the intricate details, lively facial expressions, period clothing, and beautiful settings, while fans of Jane Austen will love the witty banter and hilarious plot as Emma tries her hand at matchmaking. I wasn't sure how well the novel would translate to manga, but this did an excellent job. I was especially impressed by how closely the manga followed the plot and how well it captured the spirit and tone of the novel. Emma's story and the characters in it are timeless, and it was fun to see them brought to life on the page in this manga. I would recommend Emma to those who like manga, Jane Austen, or both. I would like to thank netgalley and UDON Entertainment for a free copy of the book in exchange for an honest review. This is a mediocre adaptation, nothing really stands out. I did enjoy the ending. Sebbene fossi prevenuta, soprattutto perché avevo già letto Manga Classic: Pride and Prejudice - a opera proprio degli stessi autori - una graphic novel che mi aveva lasciata piuttosto interdetta, e sebbene non avessi apprezzato neanche l'altra trasposizione di Emma in forma di manga, quella di Yoko Hanabusa, mi sono avventurata di nuovo nella lettura di un adattamento a causa dell'esplorazione di retelling dei classici di cui vi ho parlato in apertura di post. Sarà che avevo lo spirito giusto, Sebbene fossi prevenuta, soprattutto perché avevo già letto Manga Classic: Pride and Prejudice - a opera proprio degli stessi autori - una graphic novel che mi aveva lasciata piuttosto interdetta, e sebbene non avessi apprezzato neanche l'altra trasposizione di Emma in forma di manga, quella di Yoko Hanabusa, mi sono avventurata di nuovo nella lettura di un adattamento a causa dell'esplorazione di retelling dei classici di cui vi ho parlato in apertura di post. Sarà che avevo lo spirito giusto, sarà che ne ho parlato con la mia amica Vik (Vittoria Liant), che mi ha fatto notare che lo stile manga è sempre sopra le righe, e che gli adattatori di questo particolare manga sono stati bravissimi a non prendersi sul serio, trasmettendo proprio quella leggerezza nella graphic novel; fatto sta che ho apprezzato per la prima volta un retelling manga di opere austeniane. Ho trovato le pettinature dei personaggi femminili un po' troppo moderne, con tagli di capelli attuali o capelli che venivano spesso lasciati sciolti e senza cuffietta (!! ), tuttavia utili a differenziare per bene i vari personaggi - le ragazze bionde, in particolar modo, cosa che non era stata fatta nel manga di Yoko Hanabusa, e che mi aveva un po' confusa. L'abbigliamento maschile, poi, mi dava la strana impressione di far apparire gli uomini come insetti, in particolar modo Mr. Elton, con i suoi abiti neri, mi sembrava un ridicolo scarafaggio. Un punto a favore del disegnatore, insomma. (view spoiler)[ come quando Frank Churchill parla del desiderio di Mr. Perry di acquistare una carrozza, notizia di cui è al corrente perché gliel'ha detto in lettera Jane Fairfax, che gli scriveva segretamente. In che senso è doloroso questo taglio? Perché poi non ha senso far giocare la parola blunder con le lettere del Paroliamo dei nipoti di Emma da Frank Churchill, in quanto così non significa più nulla! Un manga senza troppe pretese, ma piuttosto ironico e, per questo, divertente. I enjoyed this much more than Manga Classics: Pride and Prejudice and even a bit more than the novel this manga is based on. I haven’t read the novel in a long time, but I remember thinking it was too slow. This manga adaptation, like all other adaptations, makes the pace a bit faster, so that made the story more enjoyable to me. The artwork is very pretty and (thankfully) very distinctive. I hate when I’m reading a manga and all characters seem to look exactly the same, so it was a relief that t I enjoyed this much more than Manga Classics: Pride and Prejudice and even a bit more than the novel this manga is based on. I haven’t read the novel in a long time, but I remember thinking it was too slow. This manga adaptation, like all other adaptations, makes the pace a bit faster, so that made the story more enjoyable to me. The artwork is very pretty and (thankfully) very distinctive. I hate when I’m reading a manga and all characters seem to look exactly the same, so it was a relief that this time I was able to tell them apart. The characters sometimes have the most hilarious facial expressions – the artwork can really make a scene funnier than it originally was. *I received an eARC of this book from the publisher (UDON Entertainment) via Netgalley in exchange for an honest review. Afraid to read and review a literary giant? Is your boredom level over 9000? So your balance sheet doesn’t balance? Have been forced to read classics as part of your school requirement? So you can’t relate to any of the socially awkward questions about great works of literature and most read classics clothed with universal appeal? Worry no mo *I received an eARC of this book from the publisher (UDON Entertainment) via Netgalley in exchange for an honest review. Worry no more folks! Brace yourselves because this one will save you and will effectively cure your boredom as UDON Entertainment proudly presents the highest quality Manga adaptation of Jane Austen classic literature, Emma, in an international partnership with Asian comics and animation studio, Morpheus. This is definitely not another required assignment that cannot be done casually at night before its due. This one is light, fresh, lively, playful, riveting, visually appealing, pleasurable, informative manga with generous page count of over 300 pages perfect for North American market and young adult readers! We all know that Emma & Pride and Prejudice were written in the Year of Waterloo between 1814-1815 by one of the England’s best novelists, Jane Austen. It was indeed a period of intense creativity; no wonder why the story was still living today. The book embarks upon the story of the consequences of getting the wrong end of the stick. After attending the wedding of Miss Taylor, Ms. Emma Woodhouse, the cleverest principal character, insisted on “matchmaking” for her close friend, Harriet Smith although she herself was convinced she will never marry. Going against the advice of Mr. George Knightley, Emma incessantly interfered to other’s romantic affair. The story focuses around the rituals of courtship and marriage; the influence of social status; the significance of individual freedom; acts of passion; level of social relationships and other kinds of romantic entanglements and misconstrued intentions. Is it a love story or a detective story? The creator of the Manga made it pretty clear to us readers that Mr. Frank Churchill and Ms. Jane Fairfax were secretly and madly in love with each other leaving Ms. Emma Woodhouse mystified which made the entire story more exciting and suspenseful. You just want to turn the pages more for the final revelation. The Manga version was able to execute various symbolic links in a flawless and convincing manner. Although the readers had been given copious symbolic hints to its somewhat romantic-mystery structure, still, the protagonist herself, Ms. Woodhouse remained clueless leaving the readers with the unknown gripping truth. I wish I was able to read the original book before the Manga adaptation so that I will be able to give justice to my review. On the contrary, by reading this manga classics edition, it inspired me to finally read one of the greatest literary books of all time. I was really grateful to UDON Entertainment and Morpheus Publishing Limited for sending me an electronic copy of the most well-crafted and well thought-out adaptation I have ever read. At first, I wasn’t able to differentiate a lot of male characters with the exception of Mr. Knightley <3. Since it was in an art form, distinguishing characters from one another was a bit confusing. I think paying attention to each character is a key. Thanks to the creative artists of the Manga because they were able to provide “Character Model Sheet” where readers can fully study the huge differences between the characters through their distinct physique, clothes, hair styles, gestures and mannerisms, shape of the face, and even their choice of words and body postures. The lush art coupled with the incisive dialogue of Jane Austen adapted by Stacy King was highly commendable. Just by looking to a particular manga character, I was able to know the individual differences of each of the fictional character. For instance, Ms. Jane Fairfax, just by looking at her illustration, I was able to get the idea that she’s reserved, modest and self-conscious type of person. Contrary to Ms. Emma Woodhouse, that by looking at her gestures, facial expressions and behavior, I knew that she’s a charming, witty, beautiful and a self-willed young lady with a dynamic personality. Crystal Chan was able to answer it confidently and according to her she writes Emma as she understands it which makes this book unique same with scriptwriters who crafted the book differently. I think one of the purposes of this book is to boost reader’s understanding of Emma’s delicate craft through vivid images and artistry as a part of story and I personally think that the creative artists and authors did a great job! All I can say is that the Manga Classics: Emma was “meticulously” adapted from the original. It was visually entertaining, a total page-turner and easy to read and to follow. The graphic format and the entire Austen story were filled with wit, sensibility, character with just the right amount of humor and subtleties. Let us all revel in the so-called “JANE AUSTEN’S MOST FLAWLESS WORK” in a teasing Manga format! *Thank you UDON Entertainment for sending me an advanced copy! 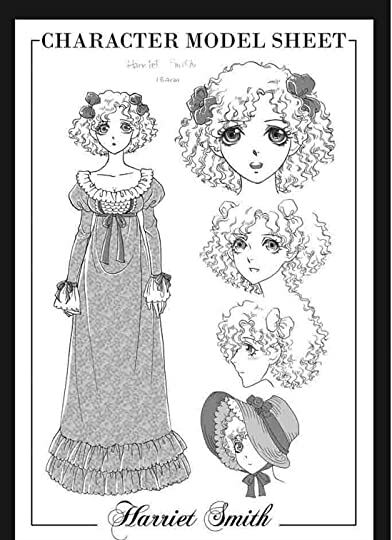 This is another adaptation in the Manga Classics line - this time of Jane Austen's Emma. And while I had praise for the Pride & Prejudice adaptation, I think this one is superior. Emma seems a much more appealing character for a manga. But more importantly, the story had a much smoother flow. In Pride & Prejudice, the narrative could feel a little jumpy and scenes would change rather abruptly. This is rarely the case for Emma, though, and just makes the reading experience all the better. The art is much the same as it is drawn by the same artist. I already loved her detailed backgrounds in previous works and she stayed true to it in this one. The female characters were gorgeous and there was quite a variety of different looking elderly characters - something one does not see that often with manga. However, while I loved the female characters and background designs, the men just did not work for me. I already noticed in Pride & Prejudice that Mr Darcy was anything but handsome (in my mind anyway!). Here, Mr Knightley seemed even worse. The artist seems to give the male characters very sunken in faces which make them look very unappealing. I think the only male character where this does not apply to is Frank Churchill. Well I must say that this was better adapted than the manga version of Pride and Prejudice put out by this publisher thanks to no additional made up scenes and a closer adherence to the original characters. My biggest complaint though is that manga will just never be a good medium for this type of story. 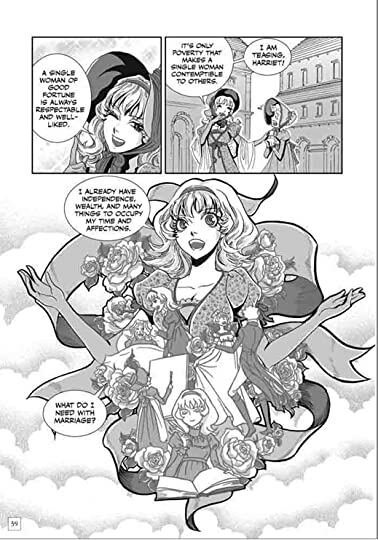 Manga typically requires its characters to over express, and so much of Jane Austen's stories are a result of subtlety and nuances. Emma's reactions in this telling were often over the top and o Well I must say that this was better adapted than the manga version of Pride and Prejudice put out by this publisher thanks to no additional made up scenes and a closer adherence to the original characters. My biggest complaint though is that manga will just never be a good medium for this type of story. Manga typically requires its characters to over express, and so much of Jane Austen's stories are a result of subtlety and nuances. Emma's reactions in this telling were often over the top and over exaggerated which often gave a different meaning to the scenes than in the original novel. A pretty accurate adaption that amused me pretty well. Emma is not my favorite Austen story but this made it a lot more enjoyable. Recommended 13+ for romance, matchmaking ending badly, and Manga-style drawings (though this is on the conservative side, so it's not bad). First, let me say that I LOVE these Manga Classics. I adore them, and I'll probably end up purchasing them in physical copy at some point. The story itself (sorry, Jane Austen), unfortunately fell flat for me. I'll probably read the original at some point, but I'm giving this edition a 3.5 star rating. Emma is a novel that I have yet to read. Sadly I have yet to read any Jane Austen and the manga classic adaptations of P&P and Emma are the only exposure I’ve yet to have. I have to say, I do enjoy them and can’t wait to pick up Austen’s novels. I think that in the Manga Classic division the Austen adaptations are the strongest- the best being P&P. I didn’t know much about Emma going in, but I know all about her now. Emma is a young girl who has just made a love-match and she is convinced she’s a matchmaker. This leads to a lot of confusion and Emma being a frustrating character, but young women are easily mislead so Austen definitely hit the nail on the head with her portrayal of Emma. I’m not sure if Emma is a revered classic, but I think it definitely should be. It has all the same workings of P&P, but it feels more fleshed out. I personally enjoyed P&P more, but I won’t decide on actually love for Austen until I’ve experienced her novels. I like the premise of a matchmaker because I think that this is one of the first introduced in literature and it’s easy to see Emma’s heavy influence in culture today, but I agree with Mr. Knightley- Emma should mind her own business instead meddling. It just leads to A LOT of drama. More so than P&P which had more drama than I was expecting, but this was tenfold. My biggest problem with Emma lies with the character Emma. She is infuriating. She feels the need to control situations and hates men who judge and base people by social status and class, but she won’t allow her friend to marry a farmer. When I think about Emma represents society and the need to place people into classes as well as being hypocrites. So, she becomes a lot better character if I view her as that. The art style is quite lovely. I just really enjoyed looking at the art and Mr. Knightley wasn’t bad to look at either. This is one I definitely recommend checking out! Cover Thoughts: I’m quite fond of this cover. It’s just very striking and beautiful. I read the original Emma by Jane Austen years ago, and I really enjoyed it. I love that they're creating all these classics in manga form. A lot of people feel a bit intimidated by big classics (Emma is a big book and Austen is very well-known for her smart writing and somewhat complex vocabulary), so this is a great way for them to read it. I've actually already read a Pride & Prejudice comic, so I knew there was a high chance I might enjoy this one as well! The art was really breathtaking, especially a drawing Emma makes of her friend Harriet in the story. They successfully captured the personality of every single character, and made their physical appearance to match it so well! Their expressions and reactions were great, I was afraid they could appear silly or make things not seem as serious as they should be, but that was never the case. And Emma's dresses were very beautiful too, one of the things I loved the most! They followed the original story incredibly well, and it's very fast-paced. There's a very important moment in the novel, when Emma starts to think about her actions and realizes that they have consequences, and it was captured beautifully in this manga. DISCLAIMER: I received a free copy of an un-edited electronic proof from UDON & Morpheus via Netgalley in exchange for an honest review. The following thoughts are my own and have not been affected in any way by this. Emma is not actually my favourite Austen, never has been as I've always thought that Emma's not a very likeable heroine BUT this adaptation made me see things in a totally new light. I have read the book 3 or 4 times, seen the movie with Gwyneth Paltrow a time or two, and yet, t DISCLAIMER: I received a free copy of an un-edited electronic proof from UDON & Morpheus via Netgalley in exchange for an honest review. The following thoughts are my own and have not been affected in any way by this. Manga Classics: Emma First things first: I received an ARC through NetGalley. I have not read the original book before I read the Manga but while reading this I got really interested to read the book, just to get a little bit more insight and more depth that you probably can't get while reading a Manga. But that being said I really enjoyed reading the story and I really liked the different characters and the relationships. The art was really good and it was overall just a really quick and easy r Manga Classics: Emma First things first: I received an ARC through NetGalley. But that being said I really enjoyed reading the story and I really liked the different characters and the relationships. The art was really good and it was overall just a really quick and easy read. This was my first Manga ever, so I was glad that they gave a little explanation about how to read it. I totally recommend this, whether you have read Emma before or not, it's really entertaining. It all worked out well for me because the art was GORGEOUS and the story was very well laid-out so it was a quick read. This was important to me because I took a really long time to finish reading Pride and Prejudice because of the lengthy prose. But after reading this, I'm really interested to go for the full-text version of Emma which, I think, was the intention here. Well done! I'm looking forward to reading more classics in this format. I was shocked when I saw this. I didn’t thought there were classics like these one! The idea’s amazing. What I love about this idea and the book ofcourse is that.. it gives more life to the story. And also, it gives young readers the chance to understand the story better. I hope to read this kind of MANGAs soon! I really enjoyed flipping the pages and looking at the beautiful illustrations. Such a wonderful book! I love that this manga adaptation of one of my favorite classics kept somewhat closely to the original story, even using some of the original dialogue. Jane Austen is one of my favorite classic authors, and "Emma" is my favorite of all her books, so I was really excited to read this one! The artwork is really lovely and the characters are all so distinct. I love their costumes and the pretty scenery. Sometimes I think the drama goes a little bit overboard though, as though the characters are shou I love that this manga adaptation of one of my favorite classics kept somewhat closely to the original story, even using some of the original dialogue. Jane Austen is one of my favorite classic authors, and "Emma" is my favorite of all her books, so I was really excited to read this one! The artwork is really lovely and the characters are all so distinct. I love their costumes and the pretty scenery. Sometimes I think the drama goes a little bit overboard though, as though the characters are shouting at each other with wild expressions, or looking dramatically shocked and amazed with wide eyes and open mouths. It just ends up looking a little silly! But most of the time, the characters expressions match the dialogue in a more demure and subtle way. I enjoyed this manga so much, and it's a great way to revisit one of my favorite stories! Can't wait to read more Manga Classics! El arte es hermoso es por ello que le doy 4 estrellas. Pero la historia, se que es un clásico muy querido, pero definitivamente Jane Austen y yo no congeniamos. No puedo con sus personajes, siempre prejuiciosos, y solo hablan sobre la posición social, dinero y matrimonio, se que eso eran los tópicos del momento y es lo que refleja la autora, pero definitivamente no es algo que me llame la atención. Amo los clásicos y muchos tratan estos temas pero de diferente manera. As 3 libro del booktubeathon. Writer, Manga Classics from UDON Entertainment.